That happened in 1967. Even though the Great Commission applies to all people, Christians are a minority among deaf people in America. With deaf Christians leading the way, Indianapolis area churches are coming alongside the deaf to support their efforts. Children and adults alike are grasping what those in the 1960s did not—the living water. “Ninety-five percent of the 1.5 million deaf children in the nation are born to hearing parents, and only 10 percent of these parents will ever learn ASL,” said Marshall Lawrence, who founded Silent Blessings Ministries near Indianapolis in 1996 after realizing his 18-month-old daughter Rachel was deaf. In partnership with Deaf Missions in Council Bluffs, Iowa and Deaf Video Communications in Chicago, Illinois, Silent Blessings began production of Dr. Wonder’s Workshop, a television program shown on such stations as TBN and Daystar. This upbeat, educational show revolves around a weekly Christian theme. “Drawing children in with animation, songs, and skits, each script imparts Bible and object lessons performed in ASL by a deaf cast. It also includes a full audio track with music, sound effects, and voice-overs in English, and captioning in English and Spanish. Seasons one through three are currently available on DVD as well,” said Lawrence. Activities abound in many churches with deaf ministries, including Bible studies, Communion assistance, greeting, VBS assistance, weekend camping hikes, and bowling and baseball leagues. “Sign language classes motivate students to learn our language. Not many deaf people have a relationship with Jesus Christ. With more people learning sign language, perhaps we can encourage more deaf people to follow Jesus,” said MPCC member Dan Kelly. Each month churches rotate as the host congregation for a potluck dinner, encouraging deaf participants to bring their non-Christian friends. “Steve Dye, who serves with the deaf ministry at Southeast Christian Church and as a sign and music artist in Louisville, led one of the potluck programs, 212 Jam, by energetically signing several songs, punctuated by his bittersweet Christian testimony. 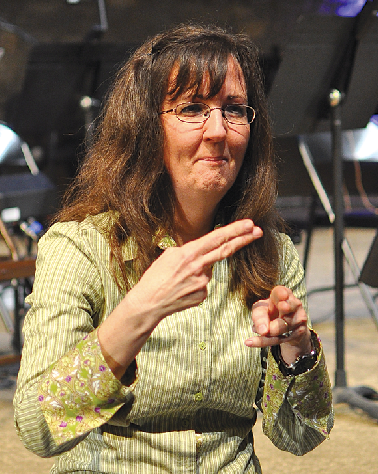 I was touched and blessed by hearing it,” added MPCC administrative assis-tant for the deaf ministry, Lynn Albin. After an MPCC sermon series about prayer, Dan Kelly coordinated an inaugural “Day of Prayer” celebrating Jesus Christ and his example of prayer. The group ended their service with Dye leading them in “Amazing Grace.” At the end of the song, more than 60 attendees followed Dye to their knees. As they raised their heads, the members in one flowing movement placed a hand on their wrists and then sent their hands heavenward, indicating they had been freed from their chains. Tonja Talley is a freelance writer in Greenwood, Indiana. Each deaf ministry includes hearing and deaf followers—all with testimonies about how God rescued them from isolation and placed them in a church family. “My six-year-old daughter would not participate in our ASL family prayer—until she watched a young boy signing his prayers on a Silent Blessing DVD. My little girl ran to me signing, ‘Mommy, Jesus knows sign language!’” Her little girl thought Jesus wouldn’t understand her. First Lutheran Church of Boston has an extensive ministry that brings fellowship and education to people with visual impairments in Boston and around the world. First Christian Church in Canton, Ohio has a vibrant ministry for children and adults with developmental disabilities, including uniquely structured Sunday school classes, fellowship dinners, and holiday programs. Southland Christian Church hosts a Jesus Prom for physically and mentally challenged adults. Previous StoryWe Liked What We Saw! Next StoryChurch Membership: Why Bother?